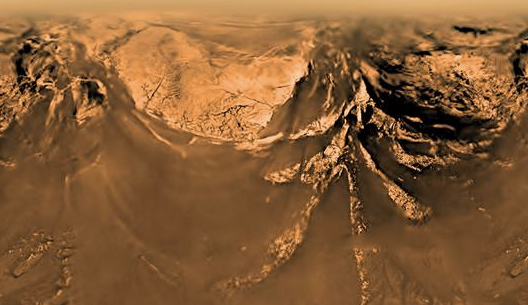 It’s been thought for some time that Saturn’s largest moon Titan has a complex internal structure consisting of multiple layers of ice and liquid water. At one point it was even suggested that there are water ice “cryovolcanoes” on Titan, where watery slush oozes to the surface and freezes solid in the moon’s 270-degree-below temperatures, in very much the same way that liquid rock does on Earth. Now, thanks to recent gravitational observations by Cassini (and who else?) some researchers think that Titan’s icy shell may be much thicker in places than once thought, making the existence of ice volcanoes and Earthlike plate tectonics much less likely. 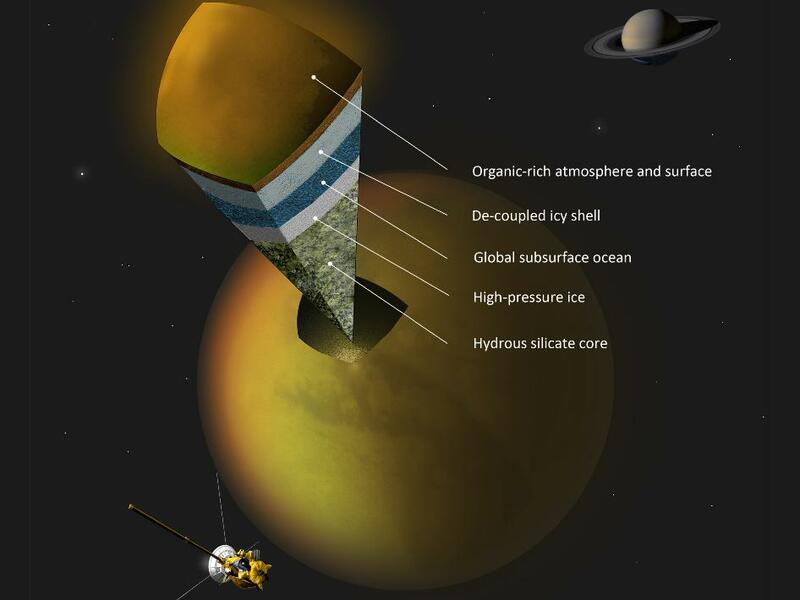 An analysis of gravity and topography data from the Saturnian moon Titan obtained by NASA’s Cassini spacecraft suggests there could be something unexpected about the moon’s outer ice shell. The findings, published on Aug. 28 in the journal Nature, suggest that Titan’s ice shell could be rigid, and that relatively small topographic features on the surface could be associated with large ice “roots” extending into the underlying ocean. One potential explanation is that each bump in the topography on the surface of Titan is offset by a deeper “root” that is big enough to overwhelm the gravitational effect of the bump on the surface. The root could act like an iceberg extending below the ice shell into the ocean underneath it. In this model, Cassini would detect less gravity wherever there is a big chunk of ice rather than water because ice is less dense than water. If these findings are correct, a thick rigid ice shell makes it very difficult to have ice volcanoes, which some scientists have proposed to explain other features seen on the surface. They also suggest that convection or plate tectonics are not recycling Titan’s ice shell, as they do with Earth’s geologically active crust. *This is especially fitting considering these findings, as the IAU has approved the naming of features on Titan after people and places in Tolkien’s Middle Earth. Yes, there are actually Misty Mountains on Titan! Next Post What Does the Moon Smell Like? How interesting – and thanks for sharing the terrific graphic.